Vietnam has a long history of war but most people just think of the American Vietnam war. The conquest of Vietnam by France began in 1858 and it finally became part of colonial French Indochina in 1887. 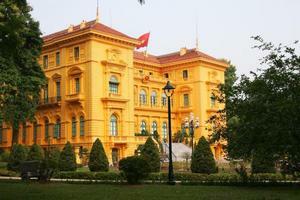 (IndoChina = Vietnam, Laos, and Cambodia) There are still French colonial buildings to be seen in most large towns. The Japanese invaded during the second world war, and were responsible for millions dying mainly from starvation because the Japanese cut them off and took all the food. At the end of the war, under the rule of Ho Chi Minh, Vietnam declared independence. But the French tried to get the country back and started another war which lasted 9 years. A year later the Americans got involved and took occupation in the south because China and Russia started backing Ho Chi Minh and the communists. Over 15million bombs, artillery shells and other munitions fell on Vietnam in this American/Vietnam war. So between WWII and 1975, Vietnam was involved in conflict against the Japanese, the French and then the Americans. And as you will remember the US evacuated Vietnam in 1975, leaving the country to be taken over by the communists. This is when Saigon was renamed Ho Chi Ming City. However, Ho Chi Ming never got to visit Saigon as he died in 6 years earlier in 1969. It’s interesting that the Vietnamese still refer to it as Saigon. Above is Ho Chi Ming’s Presidential Palace but he spent his life living in his Thai style house in the gardens below. Over the last 10 years the country has opened up, become less strict communist, and now welcomes tourists and international trade.